a book chick: "Gone Girl"
my take: I'd heard mixed reviews for this book ... some loved it, some hated it, some seemed overwhelmed by the contents so I was eager and nervous to read it myself. I had the luxury of reading it in a day on spring break. It was an intense experience. I'm firmly in the camp of loving this one. Yes, it's kind of creepy. Yes, it's a play on the headline stories and, yes, one of our Book Chick members can't get past that. It was a page turner, exciting, intriguing from the outset. To me, this is a great summer/beach read. It's a bit dark, so reading this in the sunshine helps. And this genre is a bit of a guilty pleasure; not what I'd like a steady diet of, but a nice beachy break. The Book Chicks were divided on this one - we had an interesting discussion debating the merits and flaws and throwing in all sorts of past reads to compare, contrast, and win points for actually remembering title and plot of any book not actually in hand. I just finished listening to this on Audible. I purchased it to keep me awake driving back from the Boston Marathon with sleepy children in tow. I liked the male/female voices, A LOT! This past week I spent too much time in parking lots listening to "just one more chapter". It was creepy and troubling and quite wonderful. 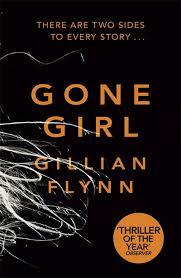 But I won't read another Gillian Flynn for a while.